To mark the new partnership with Aston Martin and Aston Martin Racing as their Official Partner, Official Watch Partner and Official Connected Watch Partner, TAG Heuer presents two magnificent special editions honoring the British brand. 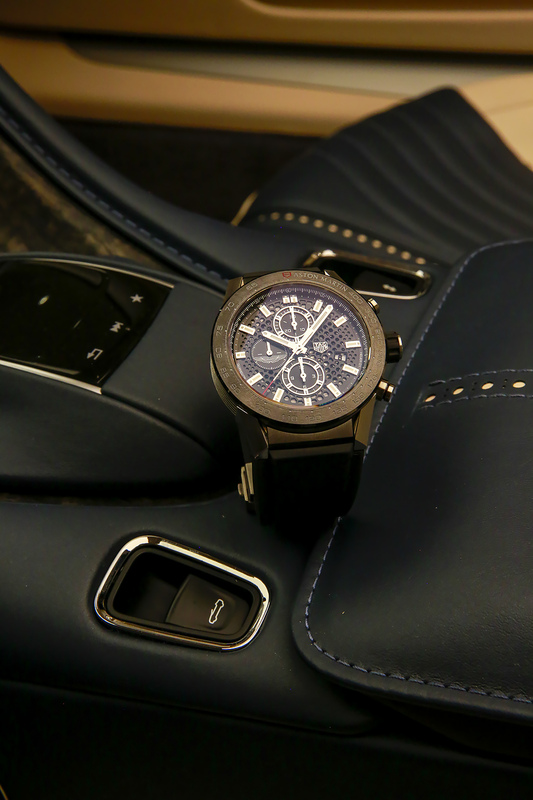 TAG Heuer and the Aston Martin design team worked together to develop the designs, drawing direct inspiration from the colors, shapes, patterns and materials characteristic of Aston Martin’s sport cars. Every detail imparts a creative touch and recalls the overarching automotive spirit of the partnership. 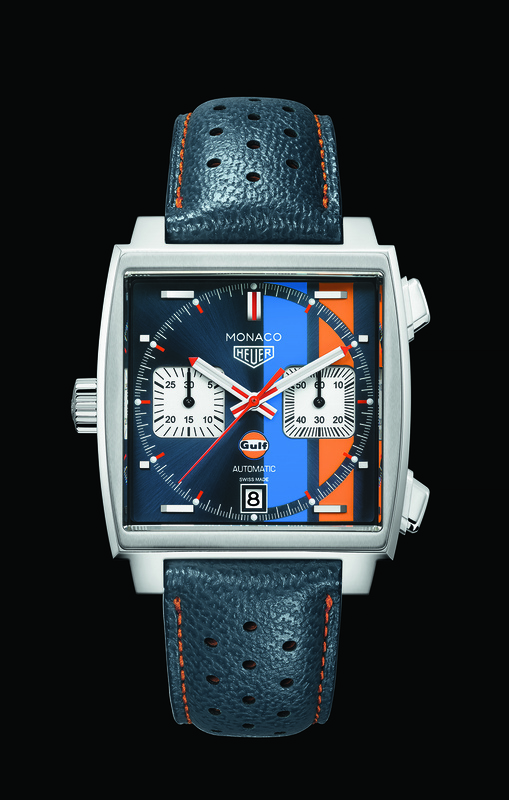 In addition, TAG Heuer is also presenting a special Gulf edition of the Monaco, in the famous racing colours and logo of the oil company that sponsored Steve McQueen in the film “Le Mans”. Heuer, Gulf, Monaco, Steve McQueen, Le Mans: A partnership of two iconic brands that has the automotive heritage of TAG Heuer at its core. 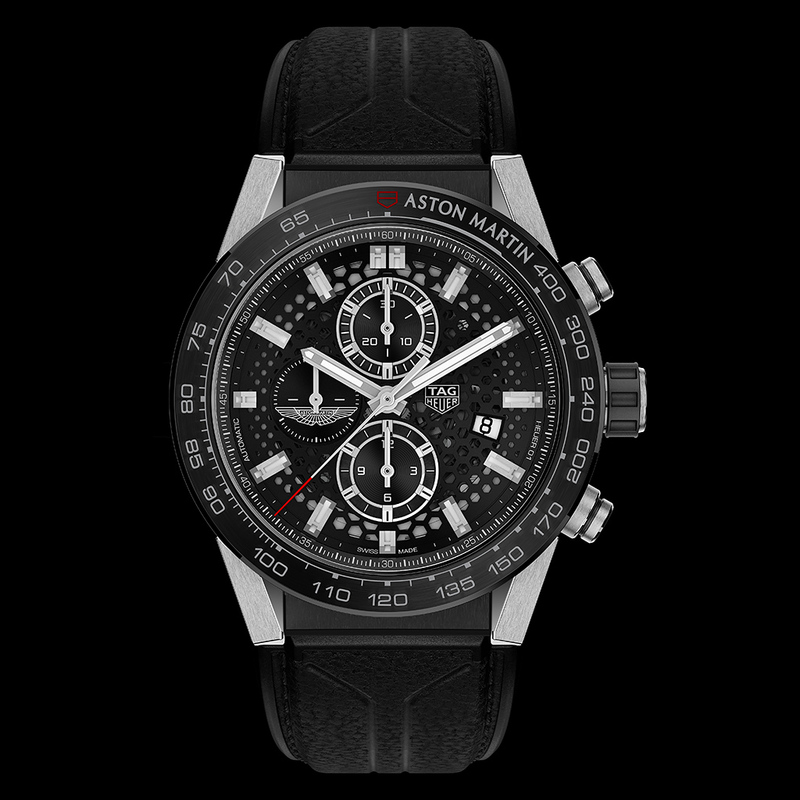 The first model is the prestigious TAG Heuer Carrera Calibre Heuer 01 chronograph, which draws inspiration from Aston Martin’s luxury universe. The famous manufacture movement is visible through the dial, which is skeletonised in a hexagonal pattern that recalls the details on the new Vantage, for an exclusive Aston Martin dial. Meanwhile, the sturdy 45 mm solid steel case also presents a design that was specifically developed for this edition, which features lines on the side to evoke speed, the race track and piston. In another of the piece’s exclusive features, the shape of the lugs has been revisited, taking inspiration from the lines of Aston Martin’s emblematic bodywork. With a black ceramic tachymeter bezel, this piece is the perfect reflection of the expertise and technical mastery arising from the partnership between the two brands. 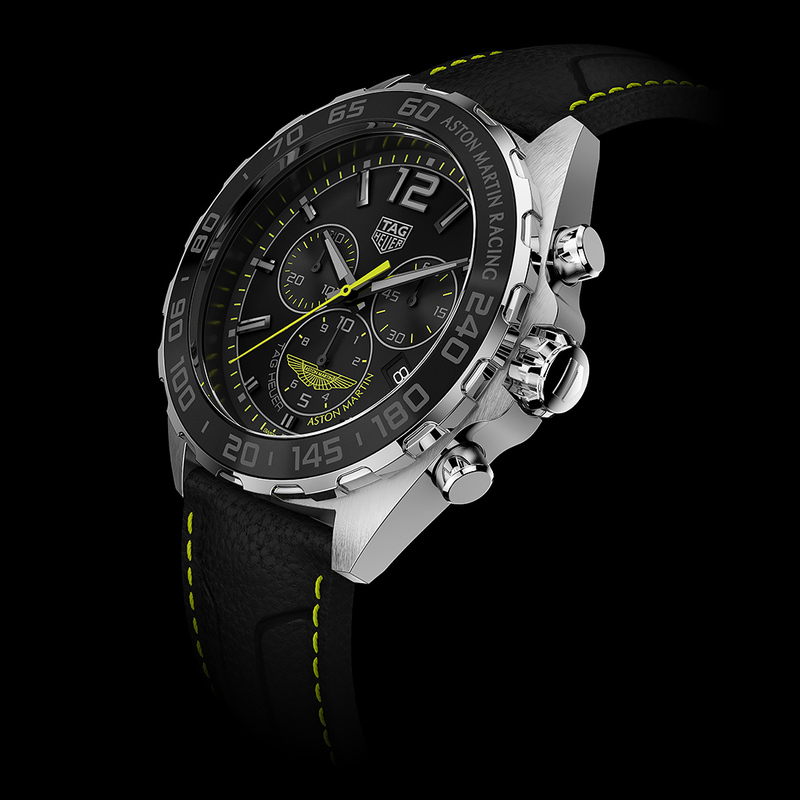 The second model is a TAG Heuer Formula 1 chronograph inspired by Aston Martin Racing. The TAG Heuer Formula 1 is TAG Heuer’s ultimate motor racing model, synonymous with performance and speed. Entirely in steel and measuring 43 mm in diameter, this quartz chronograph features a notched steel bezel and an aluminium ring with a tachymeter scale. 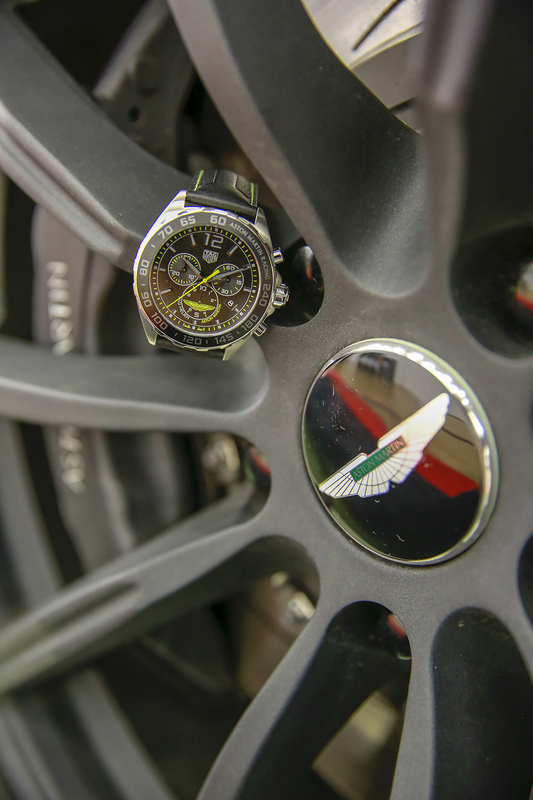 The indexes, seconds hand and Aston Martin’s famous winged logo all don Aston Martin Racing’s specific shade of lime essence and stand out against the watch’s black dial to beautiful effect. Its movement is accurate to a tenth of a second – an indispensable feature in a motor racing watch – and is displayed on the small counter at 6 o’clock, with the minute counter at 9 o’clock and the current seconds counter at 3 o’clock. The model comes with a magnificent black leather strap. 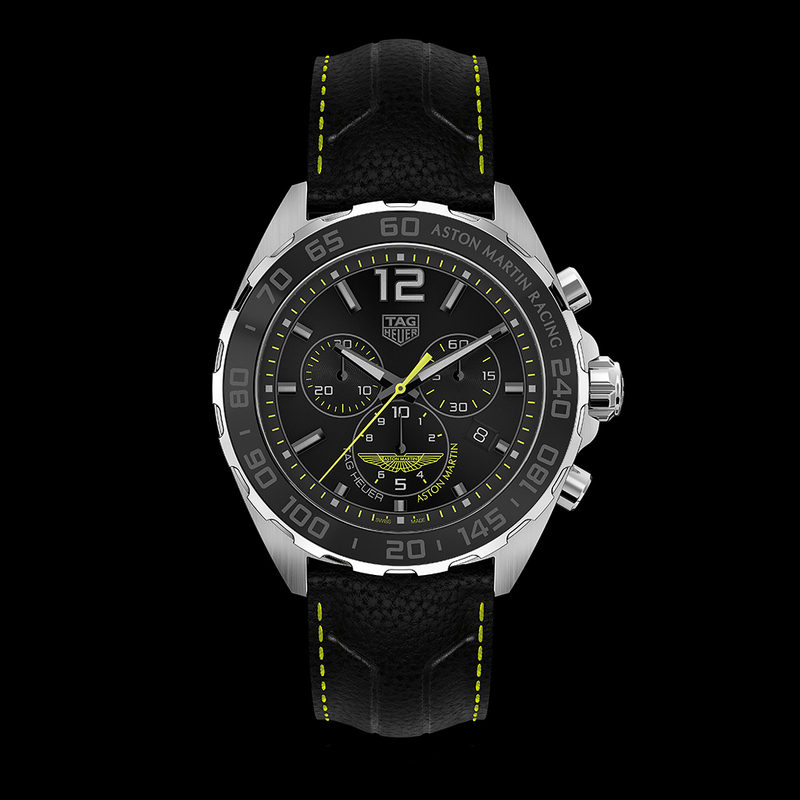 Once again this is exclusively for Aston Martin as this is the first time TAG Heuer uses a leather strap in the TAG Heuer Formula 1 collection. With lime essence top-stitching, it adds character and sporty style to the watch. Launched simultaneously in Geneva and New York on 3rd March 1969, the Heuer Monaco was the first square and water-resistant automatic chronograph in the history of Swiss watchmaking. However, the origins of the revolution lay inside the watch: The famous Calibre 11 that was the first automatic chronograph movement to be commercialised in the history of watchmaking. 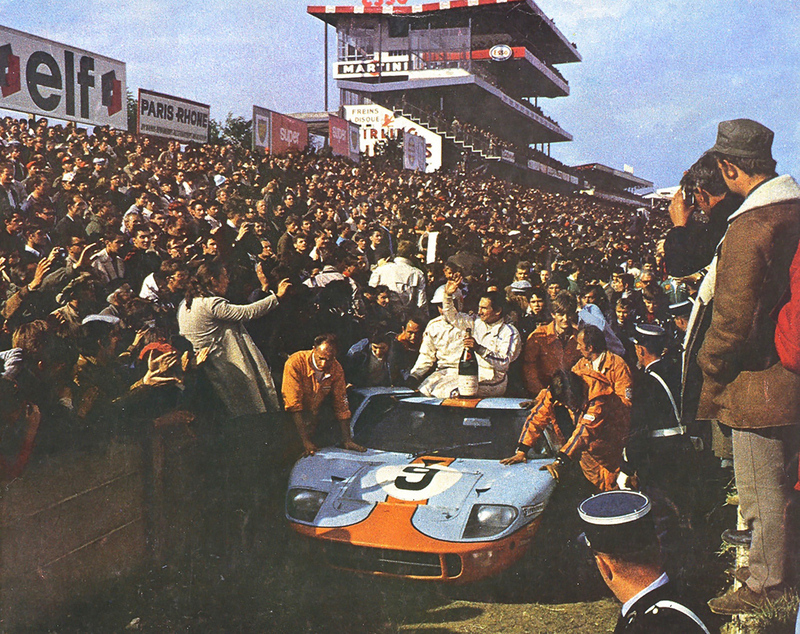 The colours of this iconic brand are referenced in the design of the Monaco Calibre 11 Gulf special edition. The 39 mm size, the crown on the left, the legendary petroleum blue dial with two white counters, the date window at 6 o’clock, the diamond-polished horizontal hour indices, the inscribed vintage Heuer logo, the calibre 11 automatic chronograph with date and water-resistance to 100 metres – all the attributes of the Monaco. 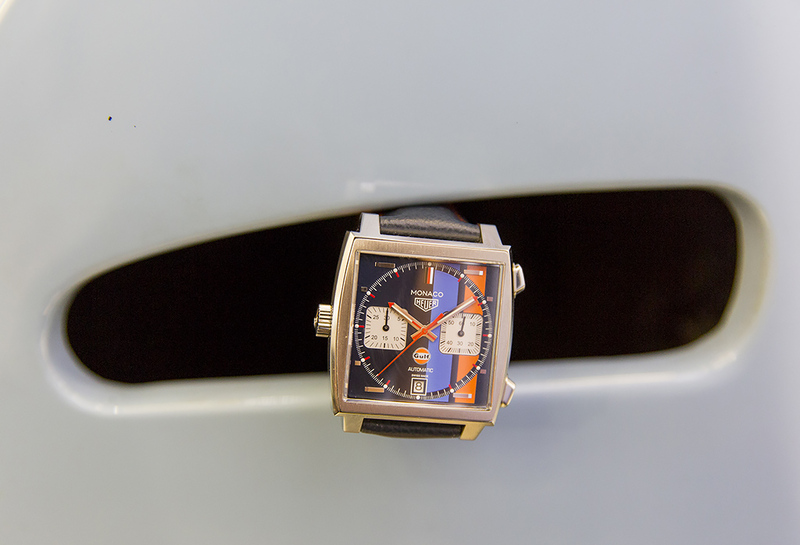 As a reminder of its origins and sporting pedigree, a light blue and an orange stripe of Gulf’s renowned racing colours have been added to the dial. The Gulf logo also appears at 6 o’clock. The piece is completed by an exquisite petroleum blue leather strap with orange top-stitching, for an elegant look and another nod to the Gulf logo. 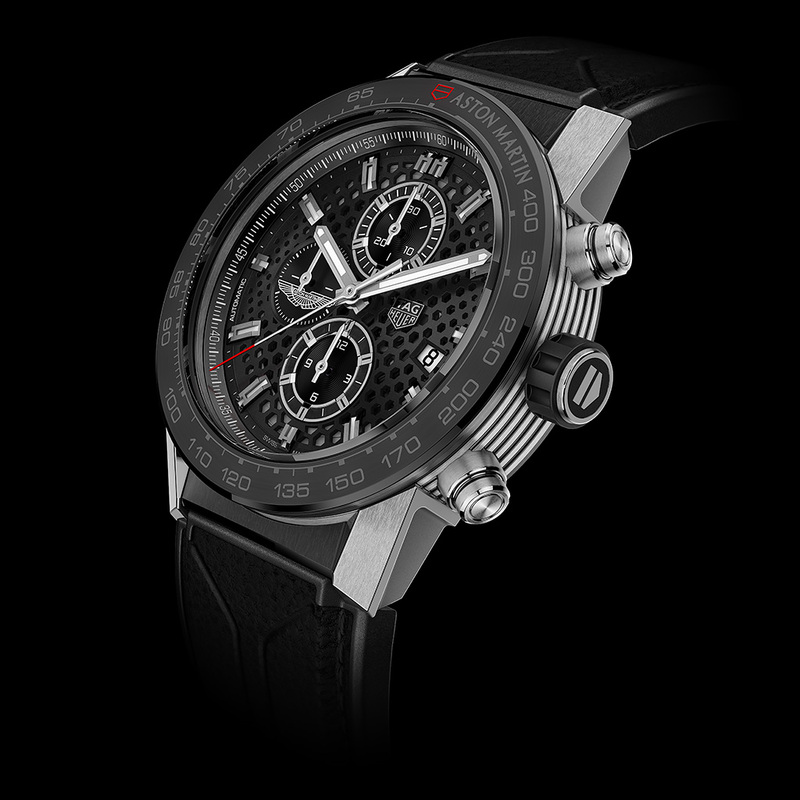 – 3 counters: rhodium plated “azurage” minute chronograph at 12H and hour chronograph at 6H, and black opalin permanent second indicator with Aston martin logo at 9H. – Matte black leather strap with lime essence stiching and special embossing. Case: – Dimensions 39X39mm. Steel, in three parts, closed with 4 screws.